There is something about the out-of-tuneness of it all. Some of the most stunning moments of musical experience for me have been when I was playing or listening to an instrument or instruments that were ‘out of tune’. Playing the eerie, distorted Noh flute, or surrounded by a pulsating gamelan orchestra, feeling the shimmer of a Himalayan healing bowl, these were wondrous moments for me. The Summer 2005 of Parabola Magazine featured 'An Intersession of Angels,' my retelling of a section from Ariosto's renaissance Italian epic 'Orlando Furioso' as part of their Epicycle series. 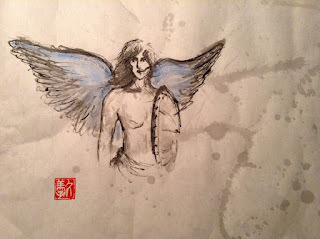 Sumi paintings by Kumiko Lawrence of Archangel Michael were also featured. The theme of the issue was 'Angels and Demons.' The search for an interesting story to retell was, if anything, too easy. The Bible, of course, has many interesting stories about angels, and I contemplated for a time trying my hand at translating a section from Dante's 'Inferno.' I tend, however, to prefer stories from traditions that readers are less likely to be familiar with. I went almost immediately to Ferdowsi's 'Shahnameh,' the epic poem of Persia. There are many fascinating tales involving demons in the Shahnameh: Kay Kavus's war attack on Mazandaran, land of the demons; the demon Ahriman's attack on Gayumart, first king of the world; the combat between the demon Akvan Div and the mighty warrior Rustam, all great stories. As usual, however, I longed for the unexpected, a story with a twist. Our basic assumption, of course, is that angels are inherently good and their counterparts, demons, are bad. But a lot of great literature (and some not-necessarily-great-but-interesting literature) has been written using the same technique, taking a masterpiece or well-known story and telling the tale from the point of view of the 'bad guy' (Richard III, Cao Cao, Judas, the Wicked Witch of the West and Loki, just to name a few). Milton's 'Paradise Lost' is a classic example, a retelling of the War in Heaven from the point of view of the losing side. But retelling the story of Milton's great epic poem would clearly be an arrogant and futile undertaking. I finally selected a section from 'Orlando Furioso.' Ariosto's epic poem is nothing if not odd, a manic, over-the-top ride, an example of channel surfing created several centuries before the invention of the television. The episode I selected is particularly odd and stuck with me long after I read it. In it, God sends his right-hand man, the Archangel Michael, to recruit several demons to assist Charlemagne in his 'good' war against his non-Christian enemies. This initially sounds like a good plan. Angels and demons make for strange bedfellows, but the demon Discord does what Discord does best, not allowing peace between the two sides. The resulting carnage and suffering of the battle eventually reaches the ears of Michael, who surely realizes that the plan was flawed. This image of angels and demons working side by side, and of angels as fallible supervisors and bureaucrats, is typical of Ariosto's strange vision.